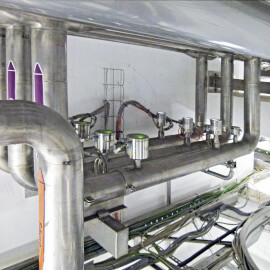 Following delivery, the milk is cooled and stacked in a tank storage with a capacity of 825,000 kg. 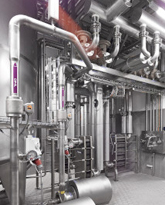 It is then separated, heated and processed into concentrate and cream in a 35,000 l plant. The planning of the entire system focused on creating a solution that combines efficient operation with ecological sustainability. 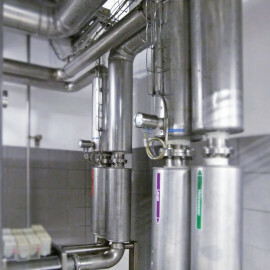 For example, the exhaust condensate is processed in a company-operated biological treatment plant.All processes are subject to a high degree of automation. 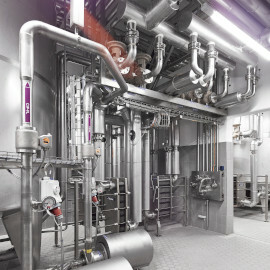 The production steps and the corresponding CIP cleaning processes are monitored continuously for temperature, conductivity, flow rate and turbidity with hygienic, high-precision sensors from Anderson-Negele.